Venus is called Earth's Twin because at the time when scientists first discovered the planet, they believed it could be very Earth like, and it is about the same size as Earth as well. 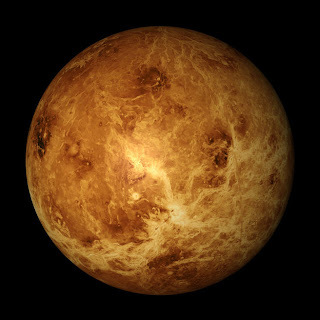 Although, now we know that Venus is truthfully nothing like Earth. It was ironically named after the Roman God of Beauty, but the true nature of Venus is anything but Beautiful. It has a thick atmosphere of acidic clouds, constant lightning storms and active volcanoes cover it's surface. When the lava cools on Venus it is much like broken glass, OUCH! A painting by Don Dixon depicting what the surface of Venus might look like. This look is just too awesome, you are so talented! A really pretty autumn look! Really nice with your skin, and I love that lip color! Beautiful look and perfect for the fall! This is just beautiful, so great for autumn! This look is great for the color of your eyes! Oh I know I will! I want to buy all of Fryinnae!! So many gorgeous colors! This is unique. And the photo's are well taken.